Download this Issue or click the image on the right. its 10th anniversary this year, BCDO has become an established and exciting event. A central element of BCDO is the presence of over 500 volunteers, who cheerfully give their time and expertise to ensure that this not-for-profi t event runs smoothly for the enjoyment of the many thousands who attend. We invite you to join us in Harrogate for the 2019 CPA National Conference. The programme promises an amazing time of worship, teaching, prayer and fellowship from Friday afternoon to Sunday lunch time. There will be guest speakers from across our Yorkshire branches, who will be exploring the theme “Home and Heart”. At our recent CPA Leaders Conference, Deputy Chief Constable Paul Netherton of Devon and Cornwall Police was welcomed into the position of President of the CPA upon the retirement of Sir Matt Baggott CBE, QPM. Part of our vision is to see ‘an active and growing Branch of CPA in every Police Service in the UK’. Let us pray particularly where Forces have no active Branch, indicated in red and especially where there is no single point of contact (SPOC). Print, and pray every day! 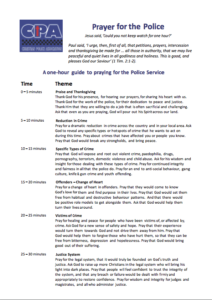 Download our Prayer Guide or click the image on the right. It is with great pleasure that I welcome you to our Annual Report for 2018. I continued to be inspired by the Mission and Vision of Catherine Gurney, who founded the Christian Police Association in 1883. The enthusiasm and energy of our nationwide network of volunteer leaders, trustees, CPA members, friends and community partners is amazing! This network covers the majority of Police Service areas across the United Kingdom. Our volunteers are supported by a small paid team, and we all work tirelessly to progress the mission and vision of the CPA. Together, we continue to encourage and support our members nationwide. 2017 was a period of sustained and exciting growth for our charity in both numbers of branches and members. We are so blessed that our charity operates across the majority of Police Service areas across the United Kingdom and I trust this annual report will give you valuable insight into some of the work we do. Download our Annual Report or click the image on the right. It was always the practice, in the early days of the Christian Police Association to hold the annual gathering at Exeter Hall in the Strand, London. Many well-known speakers were invited to participate, among them the famous Baptist preacher C. H. Spurgeon. 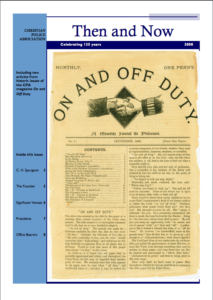 He spoke to CPA on more than one occasion but his first visit was in 1890 when he gave as his title ‘Why should a policeman be a true Christian?’ As the Gurney family business was shorthand writing, it is hardly surprising that such talks were fully recorded and many appeared in the CPA magazine. The message that follows appeared in the On and Off Duty magazine for June 1890. Download our History of the CPA or click the image on the right.